As always, Week 13 presents some interesting matchups in the NFL, particularly when it comes to coaches going up against each other. Each week, Head Coach Ranking presents its exclusive Head 2 Head numbers – comparing the rankings of the coaches that are facing off. 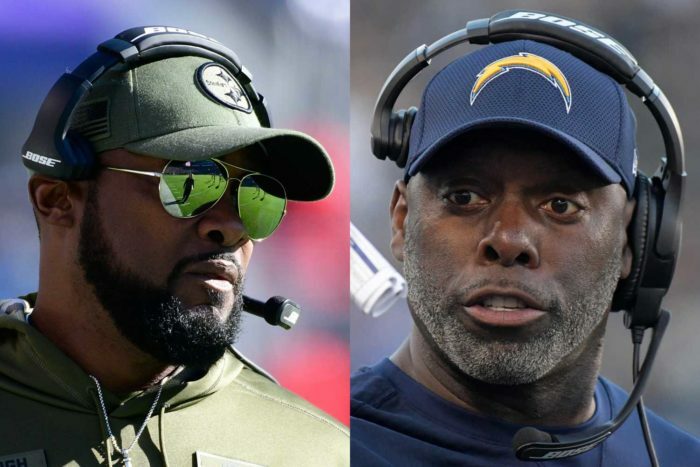 • Only one game this week features two coaches in the Head Coach Ranking top 10: The Los Angeles Chargers-Pittsburgh Steelers matchup features Chargers head coach Anthony Lynn (eighth with an HCR score of 7.4) matching wits with Steelers head coach Mike Tomlin (tied for ninth, 7.3). • The Giants-Bears game is this week’s only matchup of first-year head coaches, and the contrast is significant. While Bears head coach Matt Nagy is tied for fifth overall this season with an HCR grade of 7.7, the Giants’ Pat Shurmur is 30th with a score of 6.4. • Thursday night’s Cowboys-Saints game is the first meeting between these two teams since 2015, but there’s plenty of familiarity between Dallas head coach Jason Garrett and New Orleans head coach Sean Payton. When Payton was the New York Giants offensive coordinator from 2000-02, Garrett was his backup quarterback. • Six games in Week 12 are divisional matchups: Redskins-Eagles, 49ers-Seahawks, Chiefs-Raiders, Bills-Dolphins, Panthers-Buccaneers and Colts-Jaguars. Amazingly, only two of these games (Panthers-Bucs, Colts-Jags) are rematches. The other four games are all situations in which these teams meet twice in the final month of the season.